Unless you are building a motorized vehicle, you will probably need to salvage the bottom bracket and cranks from a bicycle frame to give your creation a human power transmission. A bottom bracket is the small tube that supports the bearings and crank hardware, as well as creates a junction for the seat stays, chain stays, seat tube, and down tube on a standard bicycle frame. The bottom bracket is kind of like the kingpin in a bicycle frame, holding the main tubing together in addition to the transmission system. A bottom bracket and the included bearing hardware are easy to maintain, repair and modify once you know the basics. A single piece bottom bracket and crankset are easy to identify since they will have a single forged steel crank arm that forms an S-shape as shown in Figure 1. Often, a single piece crankset will also only have one chain ring because it’s used on BMX type cycles due to its durability. Multi-speed single piece cranksets are also available, but usually found on cheaply made mountain bikes. As a general rule, I use only single speed cranksets for fun bikes like tall bikes and choppers and only use the higher quality 3 piece aluminum cranksets for speed bikes, lowracers and any ride designed for speed and low weight. A single piece crank arm is like a large S shaped bolt with threads in the center that allow bearing races to be threaded in place to hold all of the internals together. Like many threaded parts on a bicycle, there are right hand threads and left hand threads due to the way bearing forces act upon the parts. On a single piece bottom bracket, things are simple; everything on the left side has reversed (left hand) threads and everything on the right side (chain ring side) has right hand (standard) threads. To begin disassembling a single piece crankset, remove the locking nut shown in Figure 2 with an adjustable wrench or pipe wrench. Being on the left side of the bottom bracket, this will be a reversed thread so it must be loosened by turning the nut in the clockwise rotation as indicated by the arrow in Figure 2. Under the locking nut will be a tabbed washer as shown in Figure 3. This washer allows you to tighten the lock nut without it forcing the bearing race to tighten. Since the tab prevents the washer from turning, the rotation of the locking nut will not affect the rotation of the bearing race. Sometimes the locking washer might become jammed if the top nut is cranked too tight, so you may need to pry the tab a bit to push it back into the slot if it was jammed into the threaded area on the crank arm. More of this free and other DIY plans, www.atomiczombie.com . Bicycle cables transfer motion from your brake levers and shifters to the brake and shifting hardware with very little friction loss. Unlike rods, cables also allow forces to be “bent” around corners, so a bicycle can have all of the braking and shifting hardware attached to the handlebars, which are constantly moving. Without the cable’s ability to transfer motion around corners, all of the shifting and braking hardware would have to be installed on the frame, making it difficult or dangerous to operate. Cables are easy to install, adjust and maintain, and you will certainly be working with them when you create a new cycle, as it will normally require at least four cables for dual wheel braking and complete shifting. A bicycle cable consists of two main parts: an inner cable that consists of several twisted strands of flexible hardened steel and an outer sheath that is made up of a hardened steel coil wrapped in protective rubber. Often, there will also be a lead ball formed at one or both ends of the cable that allows connection to a lever or shifter. Bicycle cable is very flexible to a point, and then the sheath will be bent or friction will impair the motion of the inner cable, so there are limits to how tight of a corner a cable can be bent around. On mass manufactured cycles, the sheath is often omitted as much as possible, with the bare inner cable running along the underside of the frame tubing. The longer the sheath, the more losses that will occur due to sheath compression so the running of “open” inner cable is actually a good design. Figure 1 shows a typical hardware store “universal” bicycle cable that includes a formed head at each end. This is the type of bicycle cable you will most often use in home built creations, and it will need to be cut to a custom length. Several bicycle cable sheaths are shown in Figure 2. The top two cables have an end cap (ferrule) that protects the end from damage and helps it seat into the hardware it mates with. When cutting your own cables, you will probably not have and end cap, but this is okay as long as you have trimmed the end properly using techniques that will be discussed later. The cable at the bottom of Figure 2 has been custom cut, so it has no end cap. Braking cables have a larger diameter inner cable and head than shifter cables since they have to endure a much greater amount of tensile (pulling) force. The two center cables shown in Figure 3 are obviously larger than the outer two cables; they are brake cables. Also, notice how much larger the brake cable head is compared to the shifter cable head. At the top of Figure 3 is shown a badly frayed cable, which is a serious stabbing hazard and will need to be cut in order to use the cable. The hard steel strands are like needles, and will easily punch through a light glove and into your skin, so be careful with frayed cable ends or newly cut cables. Sometimes you can simply twist the strands back together if they have unraveled, but once bent, you will have to cut the damaged part off. MONTREAL, QC – Vélo Québec Association invites its active transportation partners and community stakeholders from across Quebec and Canada to the country's first rendezvous in Montreal, June 3, 2010. Slated to attend the On the Move in the Community! conference: urban planning professionals, public health and education practitioners, municipal and community representatives working on active transportation issues, as well as academics and consultants. The conference will bring together 40 local and international speakers and specialists. These experts in the field will present winning formulas that have proven successful in public awareness campaigns and cyclist- and pedestrian-friendly urban planning endeavors. The following day, Friday June 4, a series of special workshops and practical field trips will include information about the latest active transportation initiatives, from access to schools, to urban design ideas that facilitate walking and cycling in our neighborhoods. On the Move in the Community! Although Vélo Québec is best known over the past 43 years as a cycling advocate for fun and for travel purposes (la Route verte), it has also made its mark since 2004 in the active transportation field. Its On the Move to School! program aims to reduce dependence on the automobile and promote walking, cycling and other forms of active transportation between home and school. The On the Move in the Community! initiative calls on municipalities to commit to planning and developing cyclist- and pedestrian-friendly environments. The latest newsletter is now online for your viewing pleasure. A bicycle rear derailleur has several jobs. The main one is to shift the chain between the multiple chain rings on the rear freewheel. The rear derailleur must also pick up any excess slack in the return side of the chain, which will vary depending on which set of chain rings (front and rear) the chain is currently wrapped around. When riding on the two smallest chain rings, there will be much more slack chain to contend with than when riding on the two largest chain rings, so a strong spring built into the rear derailleur must pull back on this chain to keep it from flopping around, hitting the rear tire or the ground. The return chain is the lower part of a bicycle chain and it is never under any tension because it does not drive the transmission. Only the top side of a bicycle chain does any real work. Although there are quite a few small moving parts in a rear derailleur, it’s actually not complicated to install, setup and maintain once you know the basics. A typical bicycle rear derailleur is shown in Figure 1. Like most bicycle components, quality and price can vary greatly, with a typical steel departments store cycle rear derailleur priced about $20, compared to a carbon fiber body brand name rear derailleur which typically costs hundreds of dollars. Being a garage hacker, I often use only the low quality steel rear derailleurs I find on salvaged cycles, and to this day have never seen one become defective or fail if setup properly, so spending and extra $500 to shave off 10 ounces of steel does not seem worth it, in my opinion. The lower quality steer body derailleurs are also very easy to repair, and modify for trike use since they can be cut up and welded. A rear derailleur is shown in Figure 2, picking up the return side of the chain. Notice how the two small chain idler pulley wheels are almost in line with each other as indicated by the black arrow. This alignment is a good starting point when trying to calculate the best length for a chain on a custom built cycle that includes a rear derailleur. By placing the chain on the largest front chain ring and the middle rear chain ring, the length of the chain will be close to optimal when the two derailleur pulleys are in the position shown in Figure 2. A chain that is too long will flop, possibly striking the rear tire or even the ground, and a chain that is two short will pull the rear derailleur too far forward when on the largest chain rings, causing severe shifting problems. Some experimentation is always necessary when installing a rear derailleur and new chain on a custom built cycle. The front derailleur on a bicycle has the task of “derailing” the top side of the chain entering the front chain ring so that it can be move from one chain ring to the other. The front derailleur also has the task of keeping the chain on the chain ring that it is currently wrapped around, essentially working as a chain guide so that the chain does not derail unintentionally while traveling over harsh terrain. The front derailleur will only operate properly when the chain rings are engaged in the clockwise rotation since it is the top side of the chain (drive side) that must be forced onto the larger or smaller chain ring in order to change the gear ratio. Also, the chain used for a multi-speed bicycle is thinner pitch than the type used on a single speed cycle, and it is also more flexible from side-to-side, allowing it to be forced over to the next chain ring. Adjustment and setup of a front derailleur is a simple task once you understand the basic operating principals. The typical front derailleur shown in Figure 1 represents the most commonly available steel plate style that most modern cycles are equipped with. The front derailleur sits just over the largest front chain ring, held in place by the clamp that is secure around the seat tube. When the shifting lever is moved, the chain cage is pushed or pulled, forcing the chain to jump off the current chain ring and onto the next one. Newer shifting hardware is “indexed”, meaning that the shifting hardware is matched to the derailleur so that one “click” translates into one shift. Older shifters are simple levers that allow you to move the derailleur position in either direction until you have shifted gears. The older systems are much easier to setup and maintain, but do make an annoying ratcheting sound as you move between gears. To make it possible for the chain to ride on multiple diameter chain rings, a chain that is long enough to wrap the two largest rings must be used. This requires that the “slack” or return chain be picked up and pulled somewhat tight by the spring loaded rear derailleur. Figure 2 shows the rear derailleur pulling back on the lower chain, keeping the tension tight. The lower part of a bicycle chain is called the “return chain” because it never has any real tension, nor does it drive the transmission in any way. Figure 3 shows the movement that the front derailleur makes as it changes gears. The steel cage pushes against the side of the chain, causing it to jump over to the next chain ring where it is picked up by the sprocket teeth and wrapped around that chain ring in the clockwise (pedaling) direction. Back pedaling while you shift will jam up the chain since the front derailleur cannot force the chain off of the chain ring in the counter clockwise rotation. 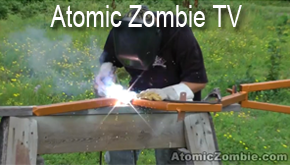 Atomic Zombie™ Extreme Machines Builder's Forum - informative DIY thread for all you garage hackers and bike builders. More cool bikes added to the Builders Gallery recently. You know what really irritates the heck out of me? I drive all the way out to the dump, pay my five bucks to get in, and the only bikes laying around are those goofy granny bikes from the late 1970s. Dog, what's the deal? I need some new parts! OK, enough whining, it's payback time. A real chopper artist can chop any bike, even this crusty old codger cruiser. In fact, the more I looked at the bike, the more I thought it would be a sweet ride. Check out all that chrome, look at that long spindly frame, yeah, I could make this happen. Normally, I do not even bother with these bike frames because of their "lugged" construction. Lugged frames are not really welded at the head tube and bottom bracket, they are press fit and brazed. Because of this, you cannot really salvage the head tube or the bottom bracket, and this makes the frame useless for parts normally. Even the rims are those goofy 27inch size, too big for a mountain bike tire. Because I was planning to hack this granny cruiser into something evil, I would be keeping most of the frame in one piece, so the project was still doable. 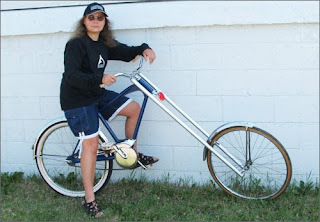 We found this classic bike at the dump and turned it into a cool contemporary chopper. "Turn down that devil music, you crazy kids!" I could hear the bike talking to me. I thought I'd better rip it all apart before I start wearing a helmet and worrying about brakes! Figure 1 shows the old fashioned bike before hacking. These styles were easy to find at the dump or at yard sales. Montreal cycling enthusiasts took to the streets this week as unusually mild weather enveloped the island. But no one will be able to use the Bixi bicycle rental system until May 1 because of the sheer work required to install it, city officials said. Montreal has boasted about its award-winning bike rental service, inaugurated last year with resounding success. But installing the estimated 400 rental stations will take most of April, even if there is no more snowfall, said Bixi spokeswoman Berengère Thériault. This section will cover some of the basics you need to know when pulling apart the steering system of a bicycle for repair or use on one of your own custom designs. A bicycle steering system is lightweight, robust, and highly efficient, and like many mechanical devices, there are several "standard" sizes that are not interchangeable. Knowing how a bicycle steering system is put together will make it much easier to salvage the parts needed for a more complex steering system such as the one used on a tadpole trike or quadcycle. Most of the head tube hardware will be the same on the bicycles you pull apart with the exception of the length of the head tube and the difference between the two commonly available fork stem diameters. This article will refer to the actual hardware that allows the front forks to move smoothly back and forth such as the bearings, cups, and races. Figure 1 shows a complete front steering assembly cut from an old bicycle frame. I often keep these parts together as a matched set, although most can be interchanged, as long as the fork stem length matches the head tube length. To remove a fork from a head tube, you must first loosen the top locking nuts as shown in Figure 2. There are usually two nuts, a large top finished nut (the larger one) and a thin locking nut that helps the two lock together over the washer, which is still shown on the fork stem. All fork hardware is unscrewed in the counter clock wise direction, since these are standard threads. A large adjustable wrench or a pipe wrench can be used on most of the fork hardware, although the pipe wrench should not be necessary unless the threads have rusted significantly. Notice that the washer, which fits under the lock nut has a key that fits into the slotted section of the fork stem. The purpose of this slot is to prevent the washer from turning along with the locking nut when you tighten it. If the washer is allowed to turn, it would also force the adjustable race to turn and become overly tight over the bearings. The largest nut in the head set hardware is the adjustable bearing race shown removed in Figure 4. This part creates a bearing surface between the head tube cup to allow the forks to turn with minimal friction, yet remain securely in place. Take note of the orientation of the bearings when you disassemble the head set as it does matter which way the are put into the cups. As you can see in Figure 4, this type of bearing includes a ball retainer and fits into the cups so that the balls face the cup. Sometimes bearings simply fall right out, so in that case you just pack them all back in when reassembling the head tube hardware. A cracked or badly rusted bearing or race needs to be replaced. Once all of the top hardware has been removed from the fork stem, the forks will drop out along with the lower bearing as shown in Figure 5. Again, take note of the orientation of the bearing if it has a cage or body, as it must be put back the same way it came out. As a general rule, the balls should go into the cups first, although there are always exceptions to the rule. 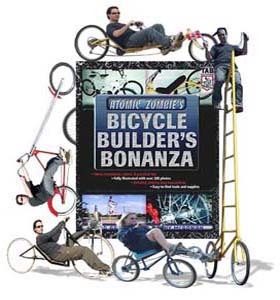 More of this free DIY bike plan at http://www.AtomicZombie.com . A bicycle gooseneck (also known as a "stem") is a very simple mechanical device used to fasten the handlebars to the front fork stem, but there a few things to be aware of that will make your bicycle building hobby much easier. Different style goosenecks are available to fit the type of cycle and handlebars used. Figure 1 shows various common gooseneck styles; a standard mountain bike gooseneck made of steel (left), a pillow block style BMX gooseneck (center), and a threadless aluminum goseneck (right). The first two goosenecks are designed to fit into the fork stem (steerer tube) and secure themselves tight by forcing a wedge against the inside wall of the fork stem. The gooseneck shown on the right of Figure 1 is designed to clamp directly to the top of an unthreaded fork stem. 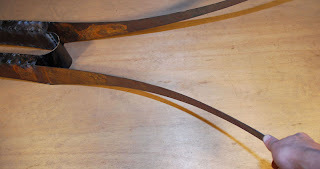 The wedge type goosenecks (also known as quill goosenecks) are the most common types you will be working with when hacking up bicycles, as they are widely used on lower end cycles. Steel goosenecks are easy to cut and weld when making your own custom steering parts for a cycle project. Figure 2 shows how the wedge slides along the gooseneck stem, creating a friction fit along the inside wall of the fork stem it is inserted into. The top of Figure 2 shows the relaxed position of the wedge, allowing it to be inserted, along with the gooseneck into the fork stem and the lower image shows how the wedge is pulled up and out, creating a very tight fit between the fork stem and gooseneck. If you have never removed a gooseneck from a fork stem, your first instinct may be to simply loosen the bolt and then attempt to pull the gooseneck from the fork stem, and this may actually work if the bicycle is brand new. However, the bolt could be taken completely from the gooseneck and not make any difference whatsoever. The "trick" to removing a wedge type gooseneck from a fork stem is to only loosen the bolt so it sticks up past the top of the gooseneck by about half an inch (left of Figure 3), and then pound it back down with a mallet as shown in the right of Figure 3. This action pushes the wedge away from the gooseneck stem, effectively removing all friction between the wedge and the inside of the fork stem. At this point, you will be able to hold the front wheel or forks, and then work the handlebars back and forth to pull up the gooseneck. Rust and dirt will be your only enemies once the wedge has been pushed down a bit. To remove the handlebars from the gooseneck, the clamp must be relaxed by loosening the nut as shown in Figure 4. Usually, a few turns will be enough to loosen the clamp enough to push the handlebars free from the stem, but if there is a buildup of rust, you may need to remove the bolt completely to pry the clamp apart a bit using a flat head screwdriver. Be careful if prying an aluminum gooseneck clamp though, as aluminum is brittle and prone to break easily. The nut and bolt are shown completely removed from the clamp in Figure 5. Some goosenecks may have four bolts holding the clamp together. This type is known as a "pillow block gooseneck". A pillow block gooseneck is shown in the center of Figure 1. This style is often used on BMX bicycles. To completely remove the wedge, turn the top bolt counter clockwise until completely away from the wedge and it will come out as shown in Figure 6. As you can see, the angle of the wedge matches the angle at the base of the gooseneck stem so that it can slide up and down. Some wedges are actually round plugs that spread the end of the gooseneck tubing out, but essentially the operation is the same - a friction fit against the inside wall of the fork stem. Goosenecks come with many various stem lengths, so keep the proper bolt along with the gooseneck in your parts collection. More of this DIY tutorial and other free tutorials at www.atomiczombie.com . Bicycle cranks and pedals are pretty straight forward once you know which threads are reversed and the basic differences between one piece cranks and three piece cranks. Tools needed: a 15mm box wrench for the pedals, a pipe wrench if you plan on removing the crank set or axle from the bottom bracket, and optionally, a crank puller to easily remove crank arms from a three piece bottom bracket axle. There are two types of crank sets and bottom brackets as shown in Figure 1. On the left is the one piece crank set, which is often found on single speed BMX bikes and lower quality cycles. Single piece crank sets are heavy because they are made of steel, but this also makes them practically indestructible, which is why they are chosen for use on BMX cycles. On the right of Figure 1 is a three piece bottom bracket and crank set. This type of crank set uses steel or aluminum crank arms that are bolted to an axle. They are the most common type found on road bikes and mountain bikes. If you are planning to build your own cycle, always choose a three piece crank set for any speed bike or vehicle that is intended for serious riding, and use single piece crank sets for experimental bikes and fun rides like choppers and cruisers. Both types of crank sets are available with varying lengths of crank arms, which typically vary in length from 165mm to 175mm. The length of a crank arm is measured from its center of rotation to the center of the pedal axle. Crank length preferences vary, and many schools of thought exist to what the best crank length might be for a certain leg length or even bicycle type. Shorter cranks are becoming a trend on recumbent bicycles, even to the point where builders are cutting the crank arm shorter than the standard 165mm to redrill and thread a new pedal hole. The best way to determine which crank length suits your body and riding style is experimentation, but I have not noticed any difference with varying crank lengths myself. Oddly enough, pedals are not interchangeable between single piece crank sets and three piece cranks sets. The threads on a single piece crank pedal are 1/2" by 20 threads per inch, whereas threads on a three piece crank set are 9/16" at 20 threads per inch. It may seem odd that the pedal axle on a BMX crank set would have a smaller diameter than a road bike, but since the BMX crank arm is made of steel, it is more robust and will bend far before a pedal will strip from the threaded hole. I have seen many stripped pedal threads on an aluminum crank arm, though. One thing all bicycle pedals have in common is that on the right side crank arm (chain rind side), pedal threads are standard right hand threads, and on the left side crank arm they are reversed left hand threads. Also, most pedals can be removed using a 15mm wrench, although some may differ or even require a special thin profile pedal wrench. Figure 3 shows how to remove the right side pedal; using a counter clockwise rotation to unscrew the threads. Figure 4 shows the clockwise rotation used to remove the left side pedal, which has reversed threads. Often, recycled bicycle parts have been well used and may be dirty or rusted, so don't be afraid to use a few dirty tricks to free those stuck pedals. I have a few 15mm wrenches that I use specifically for bicycle pedals, as there are times where a hammer is necessary to "help" things along. Another trick you can use to gain leverage over a stuck pedal is to place a 2 foot long pipe over the wrench for mechanical advantage, but be aware that you may snap the end from your wrench. A blow torch can also be used to heat up the area around the pedal axle in order to expand the crank arm hole a bit, but be careful not to melt the pedal bodies, which are often made of plastic. By now, many astute garage hackers may be thinking, "Wait! The threads should be the other way around on the pedals!" Really, the pedals rotate in the same direction that would actually unscrew their threads, right? It does seem strange at first, but due to the fact that the bearings actually transfer force at 180 degrees to the other side of the race, the opposite is true. When a pedal is rotating in the clockwise direction, forces are transferred around the bearings back to the pedal axle with counter-clockwise force. Confusing, isn't it? But 120 years of engineering can't be wrong! Rather than attempting to cross-thread the wrong pedal in a crank arm, you can usually just look at the threaded end of the axle and see a stamp indication either "L" or "R". The pedals for three piece cranks will not fit into a single piece crank set and vice versa, so that is not really much of a concern. The only thing you need to be mindful of is the first few turns of a pedal into an aluminum crank arm. If you can't get the first few turns in by hand, then either you have the pedal on the wrong side, or it is not going in straight. Aluminum is lightweight, but it is very easy to damage, and a cross-threaded aluminum crank arm is not repairable, even with a pedal threading device, since there will not be enough material to cut new threads. Start a pedal by hand and then switch to your wrench after a few rotations. Figure 7 - Two sizes of pedal threads shown The larger 9/16 inch threads for three piece cranks are shown at the top of Figure 7, and the smaller 1/2 inch threads used on single piece crank sets are shown in the lower part of Figure 7. Pedals are also available in a wide variety of styles and types, some of which hold the pilot's shoes in place using some type of clip or strap system. Clipped pedals require a special cycling shoe and allow the rider to push and pull on the pedal, allowing the legs to deliver force to the drive system at all times during a pedaling rotation. Clipped pedals are generally used by more serious long distance cyclists as they require special shoes, as well as the confidence to ride with their feet somewhat bonded to the pedals. Although the rider's feet can be removed from both clipped and strapped pedals without much difficulty, it could still become a problem in an emergency situation. The typical and most common type of pedals are platform pedals (shown on this page), and have no constraints since the rider simply pushes down on them. Platform pedals only allow force in the downward direction, but for most cycling, this is more than enough efficiency. In defense of clipped pedals, a foot slipping from a platform pedal on a very low recumbent can cause the rider's foot to catch the ground and be pulled under the cycle, so consider your choice of pedals based on our riding style and bicycle type. More of this and other free DIY tutorials at AtomicZombie.com. To figure out the width between the two fork legs, I placed them up on buckets as shown in Figure 20 and used a front wheel to check for clearances between the fork legs, tire and spokes. I wasn’t really sure where on the forks the front wheel would be yet, but I could easily determine how far apart the fork legs needed to be by using the front hub as a guide. There was a minimum safe distance that allowed the spokes to clear the side walls, which was 3.75 inches across. Once the fork legs were checked on an actual front wheel, they were set on the bench so that the inside walls were at 3.75 inches apart the entire length as shown in Figure 21. It was important to have a flat and parallel surface to set the forks on for this part of the build. 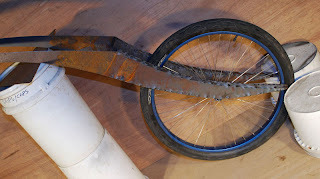 I decided to add a round top to the section over the front wheel that would join the fork halves together, and the paper template shown in Figure 22 was used as a guide to cut the sheet metal. 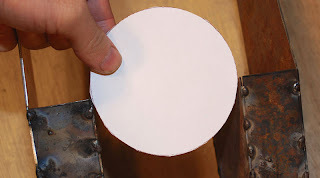 The paper disc is 3.75 inches in diameter, the same distance that needs to be between the fork legs. To make a curved top section, I would need a place that was as deep as the fork legs and as long as the circumference of half the circle. 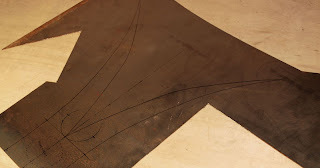 To mark the plate, I drew two arrows on the template to cut it in half and then rolled it along the sheet metal until the second arrow hit the bottom. Then a line was drawn. As shown in Figure 23, this made a square piece as deep as the fork kegs and as long as the distance around half of the template. The curved top part that will join the front forks will be called the archway, and it is bent by hand as shown in Figure 24. 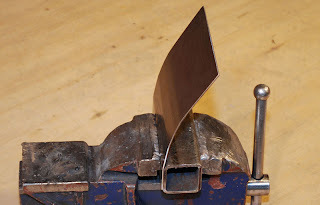 By using a vice and a square tube as a backing, a little bit can be bent at a time, making a fairly decent curve in the steel. Thinner sheet metal would be easy enough to bend right over a larger tube or round object, but this stuff was thick enough to require a bit of muscle to get it bent. 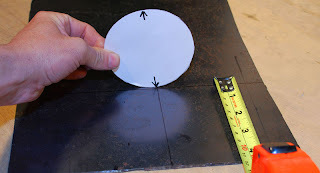 The hand bending process turned the rectangular plate into the archway shown in Figure 25 after a bit of hard work in the vice. 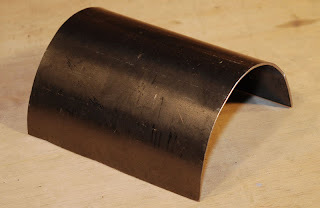 By bending only a little bit at a time, the curve turned out fairly smooth, and was easy to repair by pushing or pulling the part after it was completed. 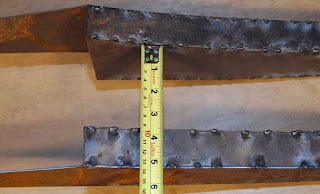 The archway was manipulated until it was very close to the required 3.75 inches in diameter and then it was welded in place at the top of the fork legs as shown in Figure 26. A tack weld at each corner is enough to hold the parts together for welding. 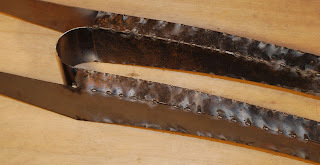 To secure the required 3.75 inch fork leg width from top to bottom, a bit of scrap steel was welded near the bottom of the fork legs as shown in Figure 27. All of this alignment and setup work was done on a known flat surface to ensure fork leg alignment. The plan was to spread out the top part of the fork side walls and have them arc outwards to form handlebars, or at least a place to weld a bit of handlebar tubing later on. Keeping to the “wing-it” style building of this project, I just bent the side walls out until it looked cool as shown in Figure 28. I have no idea how far apart the top of the side walls are, but they look about the same as a large set of ape-hanger handlebars. The top half of the front forks will also form the handlebars, so the pattern made in the last photo was “guesstimated” onto the sheet metal as shown in Figure 29. The width at the bottom of the forks was known, so I just placed the actual forks on the sheet and marked a few important points to hand draw the rest of the piece to be cut. Accuracy was not really much concern here.